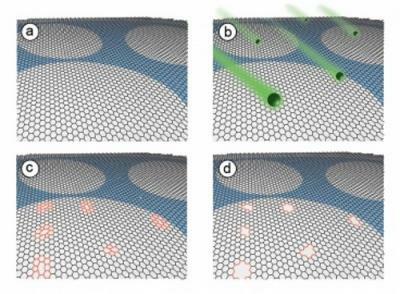 Researchers from MIT, Oak Ridge National Laboratory (ORNL) and Saudi Arabia developed a new two-step process that creates subnanoscale pores in graphene. This could enable a cheaper way to create graphene membranes for water purification, desalination and other applications. The new process starts with a graphene sheet placed on a substrate. The graphene is bombarded with gallium ions, and then etched with an oxidizing solution that reacts strongly with the disrupted carbon bonds and produces a hole (at each spot where the gallium ions hit the graphene). The average size of the hold is determined by how long the graphene sheet is in contact with the oxidizing solution. Making holes in graphene to make it into a selective membrane is not new. We've seen similar developments from Lockheed Martin for water desalination for example, and also from several groups that use graphene pores for DNA sequencing. But the researchers from MIT say that this is the first membrane that consists of a high density of subnanometer-scale pores in a single sheet of graphene.